The Copyright Office’s electronic filing system, known as “eCO”, was taken offline “to accommodate a scheduled annual power outage to allow routine maintenance by the Architect of the Capitol,” according to the Office. However, at the end of the blackout period, the Library’s information technology office could not bring the servers back online, along with several other Library managed government sites. The electronic filing system was down until the morning of September 6th. With eCO down, applicants looking to file copyrights had to mail in paper applications. On a typical day, the Copyright Office process about 1,200 and 1,300 applications through eCO, according to figures from 2013. (see also Pallante, Maria. "The Next Generation Copyright Office: What It Is and Why It Matters." Journal, Copyright Society of the U.S.A. (2014). p. 217). Accordingly, a nine-day e-filing hiatus could have resulted in the delay of almost 12,000 copyright applications. At $35 to $55 a pop for basic registration, this delay in e-filed submission could have potentially cost the office between $420,000 and $660,000 in lost fees. Adding to the woes of applicants is the difference in application processing times— paper applications can take as long as 13 months to fully process, where e-filed applications average around eight months. Not to mention the increased cost of filing on paper— applicants may have to shell out $30-$50 more than they would for registration through eCO. This recent malfunction of the Copyright Office’s electronic filing system highlights the risk associated with government managed data and the crucial role of third parties in supplementing electronic government services. A reportconducted last spring by the Government Accountability Office exposed several shortcomings in the Library of Congress’ ability to manage its IT assets. These assets include not only the Copyright Office data, but data from congress.gov and other government run websites in its $119 trillion dollar IT portfolio. Enter third party data providers. There are many online services and data repositories that can provide users with the same data available on government websites without IT problems and risks. For example, Docket Alarm, a legal research engine and analytics platform, allows users the access the entire PACER database and view every published federal court docket. Instead of relying on an outdated government-run website to deliver the latest data from federal courts, you can rely on Docket Alarm and its suite of innovative legal research tools. 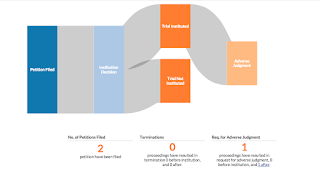 In addition to federal court cases, Docket Alarm is the only legal research company to offer users a dedicated Patent Trial and Appeal Board search engine and analytics platform. Sign up today at www.docketalarm.com.